The cell phone was developed by several prominent youtube minecraft players that are known for both for their talent with redstone and their abilities to mod the game itself. It was also actually sponsored by a cell phone company (I forget which one) that actually gave them access to their network for the project. The working GBA seems to use a lot of Command Blocks (blocks that once activated with redstone execute java code in-game), and some other blocks that I'm not very familiar with that were added in 1.10, the most recent update. I see. So basically, someone can't just make cell phones and Game Boys in Minecraft under normal circumstances. Well, if it was really done with with command blocks, those are technically part of the game so it's not a mod, but it does require actual programming language. You can kinda boil non-modded minecraft down into 3 types of creation. Survival, which is more video-gamey. Your character has health and needs to eat, is effected by gravity, has to worry about monsters and crafting armor and weapons, as well as manually collecting or crafting any building materials you use. Incidentally, this is the mode I play in, along with most of the people in this topic from a quick glance through it. Creative, does away with all those restrictions. You can fly. Monsters ignore you and couldn't hurt you even if they attacked, no death, no hunger, infinite supplies of any material you want. It's creation for creation's sake and you can make things an a huge scale in a fraction of the time it would take to make in survival. This is the closest to your paint program analogy. Then there's minecraft with command blocks. This can allow you to do all sorts of absolutely insane things as long as you know the language and how to use it. People tend to these to make adventure maps or entire new games, but they can do so much more. You could think of it more like a game making program at this point. Well then, Minecraft is better than I gave it credit for. I dabbled for a bit but didn't see the appeal and also sucked, which is probably why I didn't. Messing around and decided to crank up my render distance. This is what the main section of my world currently looks like. Just thought I'd share, cause what the heck, I think it looks pretty cool. I have actually been playing Minecraft again on the second-oldest server running. It's been up since December 2010 so you see a lot of Alpha-generated stuff closer to spawn. Very weird. 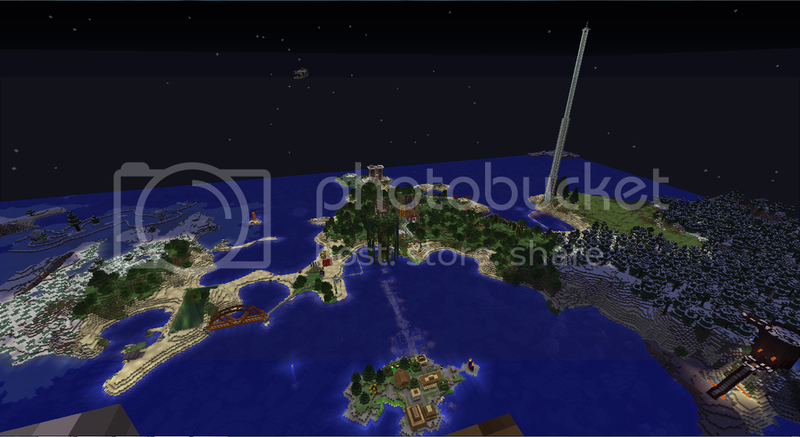 Also the world border goes out to 30 million blocks. I am on the hunt for a basic and simple server that is not overcrowded with pointless games. The one my buddy ran (which I played on) shut down. Anyone know of any good ones? Survival based with creative as an option.